Welcome to Lake Proserpine Fishing Charters. We specialise in providing personalised fishing tours for both experienced and keen to learn anglers from the novice to the expert. Our aim is to ensure you Experience the Best Barramundi Fishing Australia has to offer, fishing the famous Lake Proserpine ( Peter Faust Dam ), Renowned for being one of Australia's Best Barramundi Fisheries. 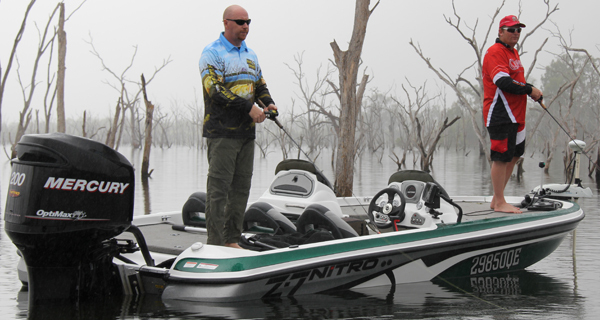 The Boat, “O’fishal Business” is a Nitro Z7. Imported from America these tournament level boats are specifically designed for sportfishing in comfort, combining safety and style while maintaining a stable and spacious fishing platform. Powered by a Mercury 200HP Optimax and built to survey requirements “O’Fishal Business” will have you fishing for Big Barra fast and Safely.